I’ll never forget my first glimpse of Vietnam. It was the spring of 1968, after the disastrous Tet Offensive had resulted in an escalation of the war. 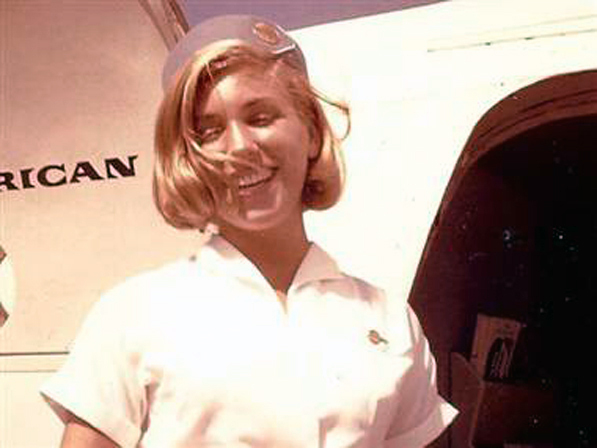 I was flying my first volunteer flight as a Pan Am stewardess into Saigon to pick up American soldiers and deliver them to their “R&R” (rest and recreation) destination. Glued to the airplane window as we approached Tan Son Nhut airport, I was astonished to see actual bomb craters and smoke rising from scattered skirmishes on the ground. I had to give myself a reality check: was this really me, and was I really seeing this, and were American men really being killed right below me? I thought I had seen it all on the nightly newscasts at home, but somehow I was shocked to see this vision of hell first hand. As we had been briefed, the pilots made the steepest descent I had ever experienced in an airplane. I remember thinking about all the stories of bullets being found in the fuselage of Pan Am airplanes, and the jokes about Pan Am pilots sitting on their manuals for a little extra protection while flying in and out of Vietnam. In my purse, I carried the paper that awarded Pan Am stewardesses Second Lieutenant in the U.S. Air Force status, which meant that under Geneva Convention rules we would be treated as officers in the event of capture. Used to providing elegant in-flight service to our passengers in a rather formal atmosphere, I was about to experience the most surreal flight I had encountered to date. We had been told that “almost nothing was by the book,” but only the male purser on our flight and the pilots had flown many flights to Vietnam and knew what that meant. As we taxied around the airport, I felt overwhelmed to see the sheer numbers of war machines of all types buzzing around seemingly everywhere. As we swung the door open, the noise was deafening, and the hot humid air enveloped me, taking my breath away. Our stewardess uniforms were made of fabric that was supposed to be “all weather,” which really meant that it was too hot in summer and too thin in winter. Add to that the fact that we were still required to wear stockings and girdles, and I think you can imagine our discomfort. As I stared out of the open door, I became aware that the cargo being loaded onto our plane was body bags — a seemingly unending stream of body bags — each one containing somebody’s precious husband or son or father or boyfriend or uncle or friend. I don’t think anything could have prepared me for the sight of the soldiers that boarded our airplane. I was expecting to see excited young men ready for a new adventure, laughing and joking with each other, and relieved to get away from the war. But as the men quietly filed aboard the airplane, I clearly saw the faces of trauma. Many were strangely quiet, with expressionless “masks,” and most of them stared at our “round eyes” as if trying to take in a bit of home. I had no idea how young these men would be, but I wasn’t expecting them to look like they should be in high school! Twenty-five at the time, I wasn’t used to being called “Ma’am,” and I felt strangely old. I’m convinced that my experiences with these traumatized men helped fuel my later professional interest in the study of trauma. The Pan Am pilots, mostly ex-military men, felt deep empathy for these soldiers, and their announcements reflected it. And here’s where our very talented male purser came in. As funny as any stand-up comedian, he knew exactly how to handle these traumatized men. Totally throwing aside our traditional announcements, he used colorful language that I had never heard uttered on a Pan Am intercom. He spoke right to the men, as if he were waking them up from their nightmare. And he loved to tease the stewardesses! As we were doing our regular emergency demonstrations, we were supposed to point overhead to the forward, center and aft life rafts in the ceiling. During the part where he was supposed to say, “forward, center and aft life rafts,” he mixed it up and said “aft, center and forward.” By rote, all of us stewardesses pointed out the rafts in their normal sequence. He said, “So you see, guys, our young ladies don’t seem to know their ‘forward’ from their ‘aft! '” The soldiers exploded in laughter, and the tone was set for helping to relieve these young men’s burdens for a short time. By the end of the flight, some of the soldiers seemed less robotic, and their eyes were coming alive. This was the first of four soldiers that I eventually agreed to have as pen pals. When I began to receive notices, one by one, that each one had been killed, I started to regard myself as a jinx and stopped writing letters. Now I regret this, but at the time it just became too painful for me to be able to put a face to the names of dying men. Music is where my memory of Vietnam lives, and this time of my life comes with its own special sound track; Creedence Clearwater Revival, The Doors, Buffalo Springfield, Jimi Hendrix, Jefferson Airplane, Marvin Gaye, Ike and Tina Turner, Bob Dylan, Crosby Stills & Nash, Otis Redding, the Animals, Aretha Franklin and Edwin Star who sang “War” (“War! Huh! Good God, y’all! What’s it good for? Absolutely nothing!”) The music describes wartime — especially the ambivalence about this particular war — better than words can convey. When I hear it, I feel as if I were back there. I think that any of us Pan Am employees who flew into Vietnam feel that we, too, were a part of that war. At the time, many of our regular destination cities in Asia were teeming with American soldiers, and wherever there were American soldiers, there was the music, blaring and insistent. In a bizarre conclusion to my first flight to Vietnam, I asked the Captain if I could sit in the cockpit for landing. He said, “Of course.” Again, since all rules were mostly suspended, the Captain decided to generously allow the engineer, who never really got to fly the airplane, to do the landing. On final approach, just before touchdown, the left wing of the airplane dipped way too close to the runway. At the last moment, the Captain grabbed the controls back, and I think that every person in that airplane knew that we probably narrowly escaped disaster. Nobody in the cockpit spoke. I could tell that the blood had drained from the pilots’ faces, and the engineer was shaking.